67 York Street invites you to attend the official opening in collaboration with Future Icons & Utopia & Utility, in association with Crafts magazine & Kalevala Gin. For the occasion Utopia & Utility studio is curating the space for one week with the first ever exclusive Utopia store. 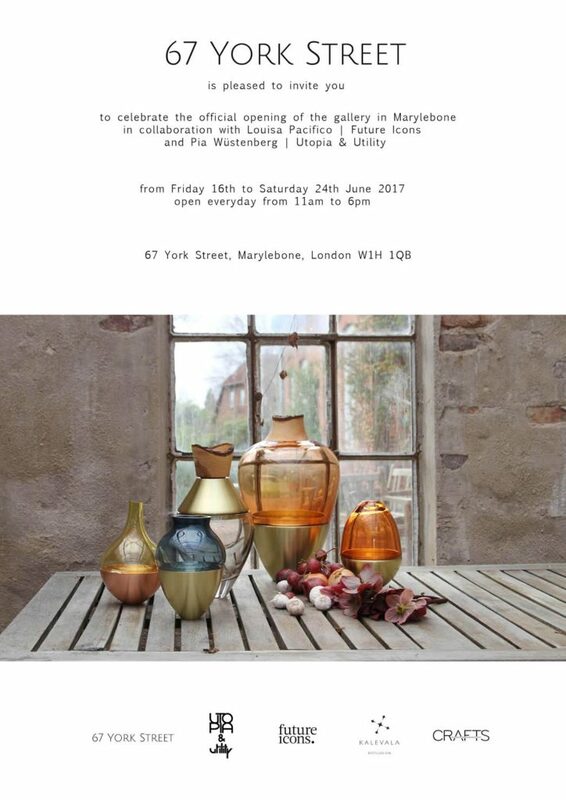 Showcasing the signature collections of Stacking Vessels will be on show, as well as the latest mixed media additions and a selection of Processed Paper jewels. Utopia & Utlilty will also launch a new capsule collection called ‘Seed & Floret’ – an exclusive for the 67 York Street opening. Located in the heart of Marylebone, 67 York Street is London’s newest destination space to discover the finest contemporary practitioners in design, craft and art today. Each week, a new brand will take over 67 York Street and transform the space into a gallery, pop-up shop or an installation. The annual programme will be curated by our Creative Director: Louisa Pacifico – an industry expert in commercial craft and design. We are all looking forward to welcoming you in this ephemeral gallery in the heart of vibrant Marylebone.